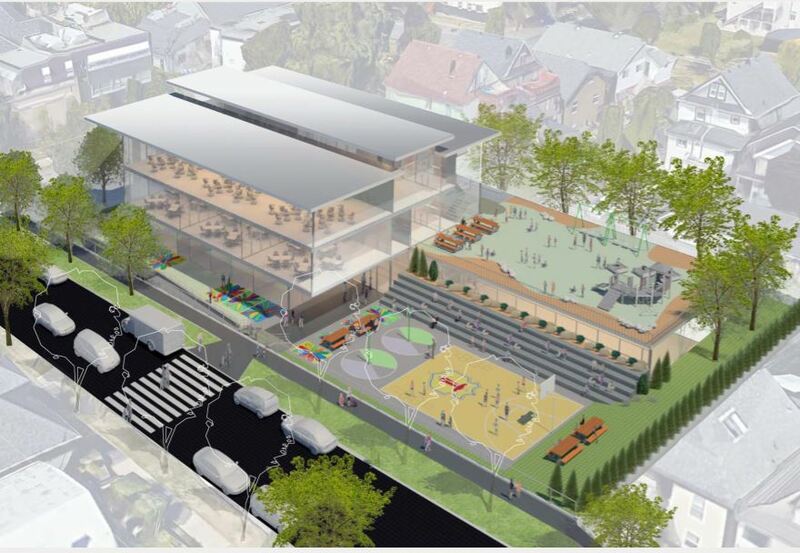 The major development proposal for 1535-1557 Grant will have an Open House this coming Tuesday, 11th September, between 5 and 8pm at Britannia Secondary School. I attended the February meeting of the Grandview Woodland Area Council last night. 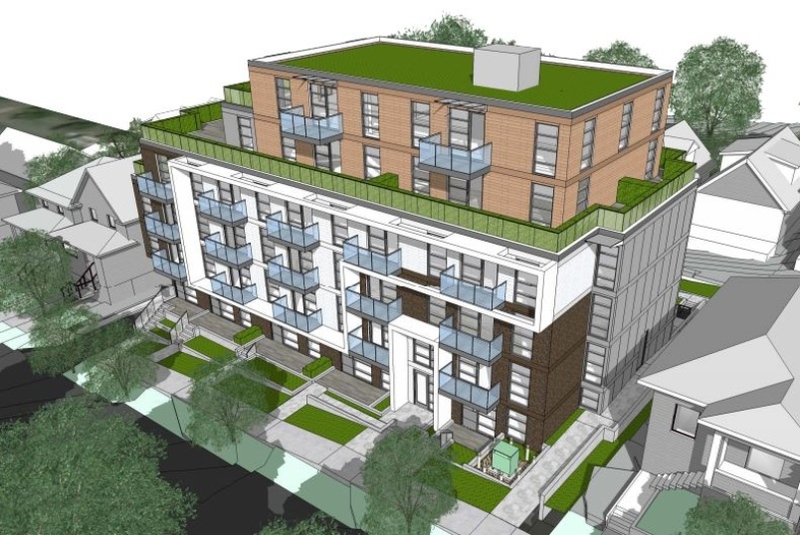 There was a full house and a lot of intelligent community discussion … three neighbours of a proposed development on Grant Street, two of whom are professional architects, gave a presentation in opposition to the project as currently designed. 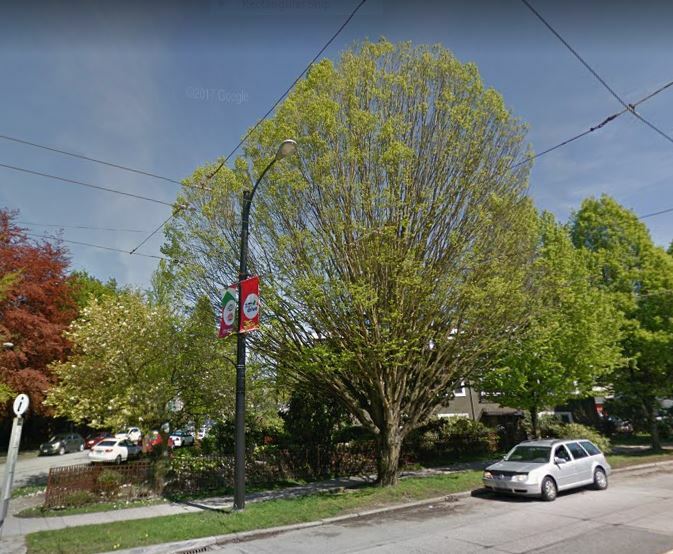 The developer has purchased four lots — 1535, 1545, 1549, and 1557 Grant — and proposes to demolish the 1½ -3 storey heritage houses on those lots and to build a 6-storey secured rental apartment complex of 40 units. Four of the units will be 3-bedroom, 12 of two bedroom, and 24 with one-bedroom. They claim that this will be a “family-oriented” development even though the majority of units are unsuitable for families with children. 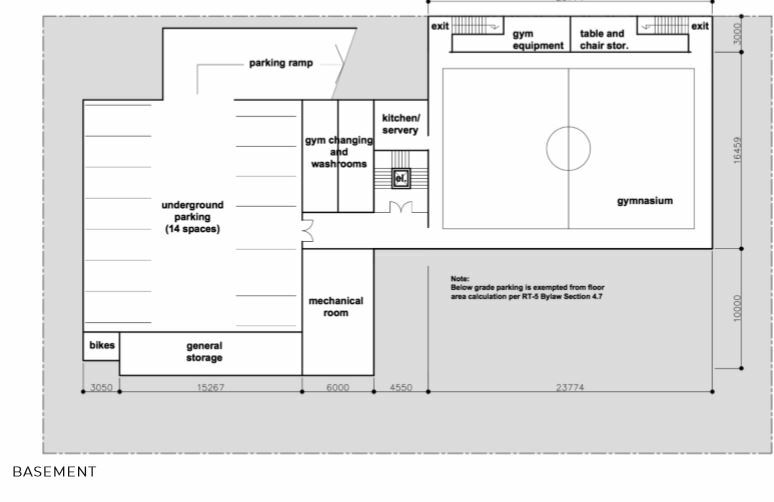 The zoning under the Community Plan allows for a 6-storey apartment building (although formal approval and a public hearing is still required) but the developer will be seeking a number of zoning changes including a significant reduction in parking requirements. They wish to supply just 19 automobile spaces for the 40 apartments. This proposal is one of the five allowed under the Pace of Change regulations in the first three years of the Community Plan. Because it will be secured rental, the developer will have the Community Amenity Charges (CACs) waived, saving considerable expense. The presenters have written to the Planning Department with their concerns. They explained that a large 6-storey building in the middle of this block of 2-3 storey houses would be out of place, especially as there is no planned transition between the smaller houses and the apartment building. They note that there are considerable slopes both east-west and north-south, and no lane, making access to the new building and along the narrow Grant Street very difficult, especially for emergency vehicles. 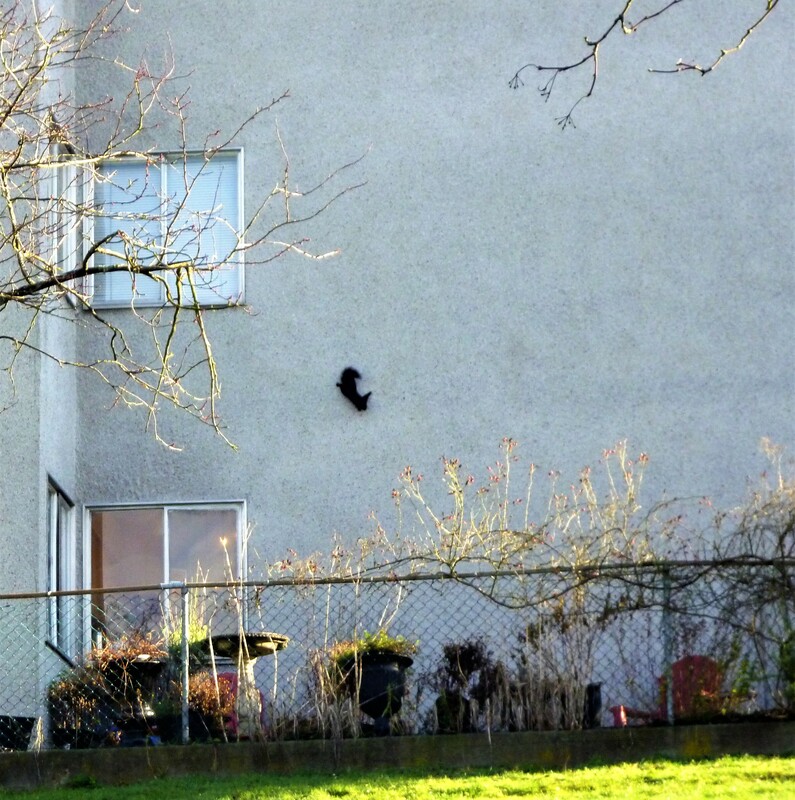 The shadowing of the neighbouring houses is expected to be extreme. There are also issues of noise and the loss of heritage trees. It was noted that these will be market rentals (one-bedroom suites starting at about $1,800 a month) and so will add nothing to affordability in the neighbourhood. The four houses being demolished are all currently rentals and most have basement or other additional suites. 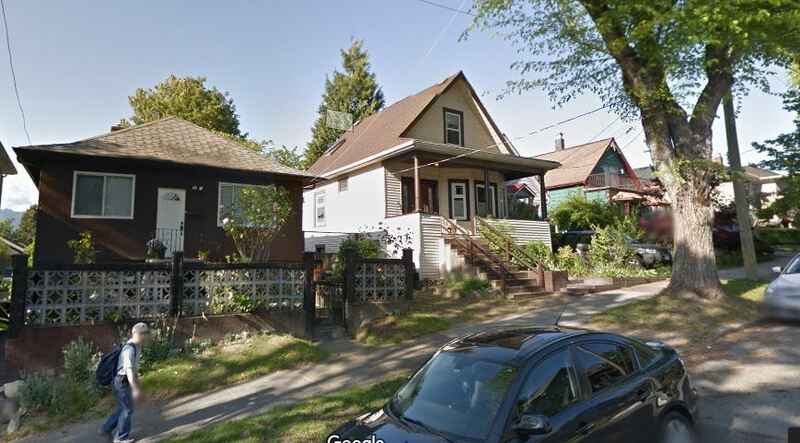 It was pointed out by several members of the audience that in Grandview there are virtually no “single family houses”; most so-called SFHs have additional suites and are therefore twice or more as dense as some might think. 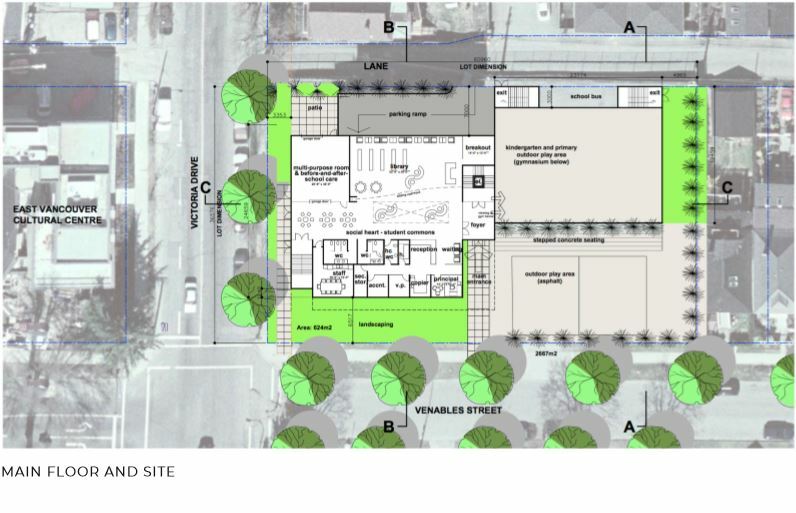 Several other audience members called the project a “block buster” which will inevitably lead to more such projects in similar low-rise streets and blocks. This is a difficult one for me. I approve of the concept because we need a lot more purpose built rentals in Grandview; I have no problem with the size; and I have no issue with heritage problems as the street being redeveloped is not even close to being a pristine example of our Edwardian past — the houses are old rather than worthy. However, this development is a typical Vision Vancouver giveaway, where the developer is to gain an enormous financial advantage for building units the rents of which 75% of the working population in the city cannot afford. So, as keen as I am to see rentals built, I have to list myself on the opposition side in the hope that something more affordable can be developed on the site. There is more information in the this recent article in the Vancouver Courier. Way back in 1964, Roy Babic erected a modern building to house Babic Electric, the electrical and lighting store he and his wife ran at 952-956 Commercial. 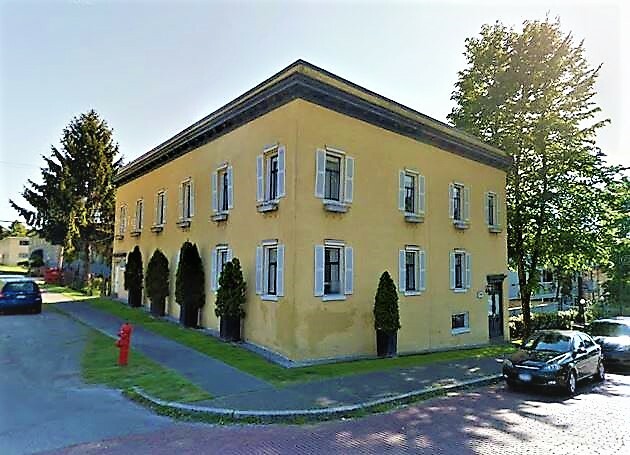 It had a double storefront facing the Drive, with two apartment suites above; one with an entrance from the lane, and the other on Parker Street. The southside wall of the structure running along Parker to the lane was a plain utilitarian painted wall. More recently, the wall has received a few coats of, usually, green paint that often reflects as shallow blue. 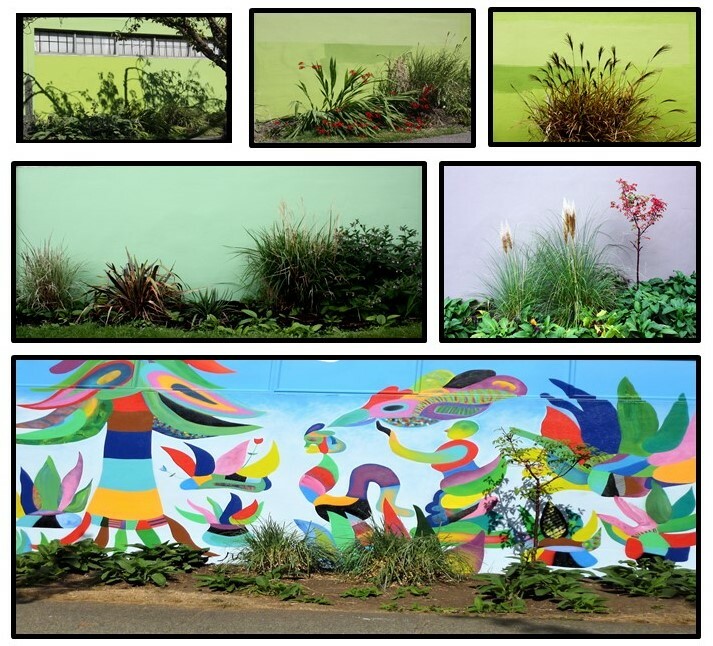 About five years ago, I began a series of photographs — the Greenspace series — that have illustrated the changes to the wall and the foliage over the years. Earlier this summer, the wellness therapy clinic that has taken over the storefront decided their wall needed a mural. My quiet greenspace is no more — and the plants don’t seem to have come through it well. Select image for a closer view. My personal favourite tree in the entire neighbourhood has been cut down. This magnificent tree stood at the south east corner of Commercial & Adanac. Its majestic dome of a canopy was a wonder to behold. I used to see it just about every day as I waited for the #20 going south, and I would day dream about the photographs I could take of shapes and patterns. But no more. That wonderful tree is now a pile of lumber surrounding a stump. I guess the tree was on city land. I wonder if they have to go through the same rigorous processes that they quite rightly enforce on property owners seeking to remove a tree. Somehow I doubt it. 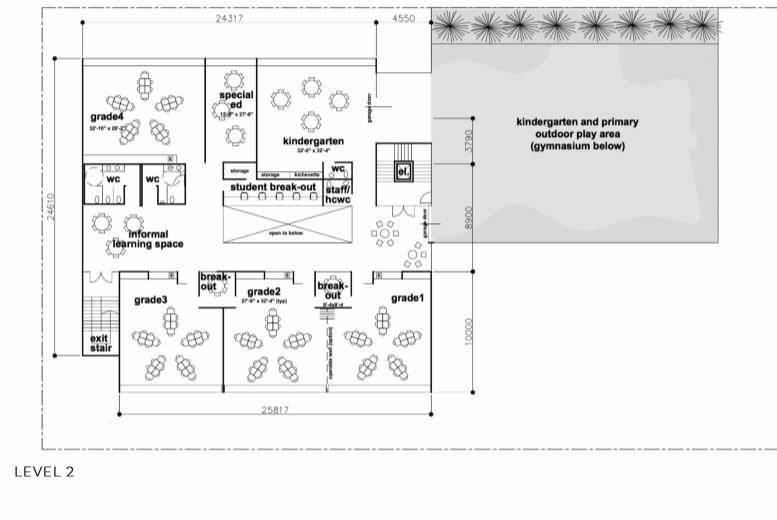 During the first half of last year, we reported on efforts by St. Francis of Assisi church to rebuild their school. They had wanted to build it on Semlin, but community pressure obliged them to rethink and to consider redeveloping the school site they already operate on Victoria Drive. 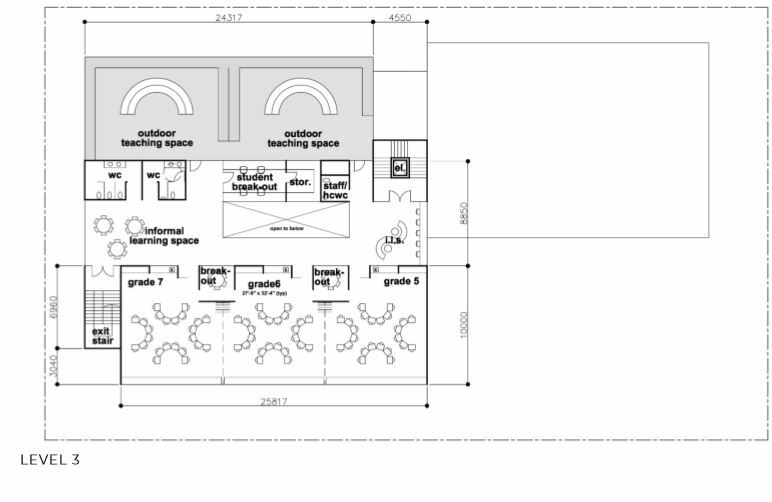 They have now released the first draft ideas of what such a school might look like. These are presumably just drafts at this stage, but they give us a good idea of what might be proposed. Select any image for a larger view. I took a walk around the neighbourhood today, taking advantage of the splendid weather. I have been sedentary most of the winter, so it was a lovely feeling to catch up with the streets and buildings once again. 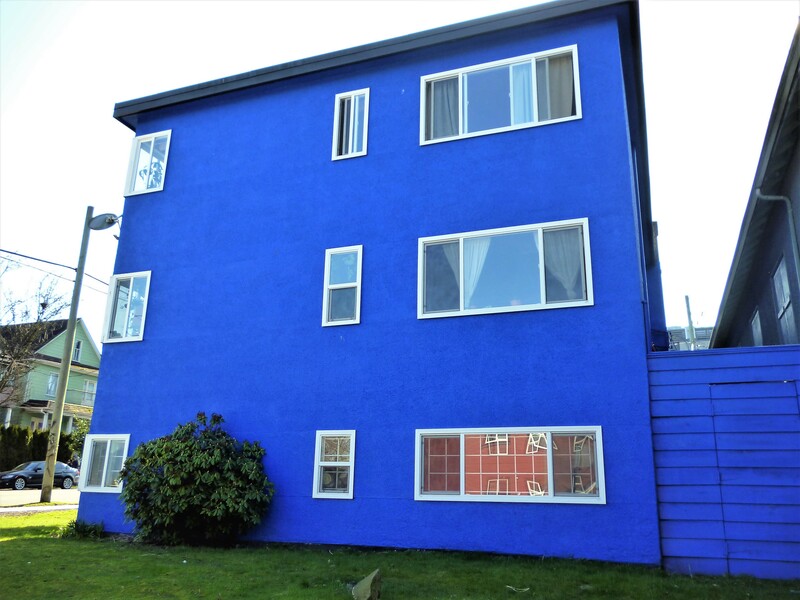 Perhaps it was the startlingly clear bright light, after so many months of grey and gloom, but I really hadn’t noticed before just how blue the house on the corner really is. I love it! That’s the way to brighten up a neighbourhood! You are currently browsing the archives for the Places & Spaces category.